Abstract: Mass shootings in the U.S. appear to be random and unpredictable events. However, a closer examination of these events reveals certain trends and commonalities between them. In this study, we classify mass shootings using Principal Component Analysis as well as Factor Analysis. We compare the clustering performance of these two methods and provide conclusions regarding similarities and distinct features between mass shooting incidents which arise from the different clusters of incidents are discussed. Salient variables that help with clustering shooting incidents and their determination are highlighted as well. To address the question on whether shooting incidents are occurring with a significantly different intensity in recent times, we model US mass shooting incidents as a non-homogeneous Poisson process (NHPP). We also utilize the NHPP model for variable selection. Relevant conclusions from various NHPP models will be presented and discussed. Statistics research projects conducted by two teams of Hope College students have earned first place and honorable mention in a national competition. Both have been honored in the Fall 2018 Undergraduate Statistics Project Competition. The two papers were written in fall 2018 introductory statistics classes taught by Dr. Yew Meng Koh. 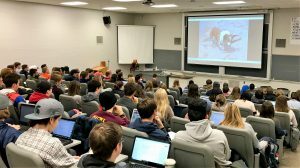 This makes a total of seven student papers from Hope College students in the past two years that have won awards in this national competition. Sixteen students were recently inducted into the Michigan Delta chapter of Pi Mu Epsilon. Founded on in 1914 at Syracuse University, Pi Mu Epsilon currently has over 350 chapters at colleges and universities throughout the United States. Hope College has had a chapter since 1974, the fourth in Michigan. The purpose of the society is to promote scholarly activity in mathematics among the students in academic institutions. Students were invited to join based on their GPA in their mathematics courses as well as their overall GPA. The induction ceremony was held on April 15 at 6:28 p.m. (or two pi o’clock). After the short ceremony everyone enjoyed our tradition of eating pie. The students inducted this year are: Meredith Bomers, Marcus A. Brinks, Anna J. Carlson, Lauren A. Cutler, Kara Dahlenburg, Camille M. Fogg, Yechan Hwang, Scott D. Joffre, Jacob M. Kelley, Danielle P. Reiber, Kyra D. Ross, Forest D. Rulison, Bethany M. VanHouten, Hans J. Veldman, Roger D. Veldman, and Micaela M. Wells. It’s no joke! The Mathematics Department is hosing a Spring Social on Monday, April 1 starting at 6:28 pm in VanZoeren 247. There will be a number of different games and puzzles to play as well as some pizza and soda pop to consume. Word has it that there will even be some pizza that doesn’t contain pineapple. Time to sign up for a math class! Since registration for fall 2019 classes starts soon, we thought you might want to see some details of the upper-level mathematics classes that will be offered. Math 321: History of Math is a great course because we get to look at the whole scope of mathematics and pick out some of the most fun parts to study more closely. You’ll learn interesting new things about math you thought you knew and new interesting things about some of the people that made that math—from the quadratic formula to the Riemann Hypothesis and lots of stuff in between. Math 331: Real analysis is a course that many math students have been waiting for since the day they started their first calculus class. This course explains why and how everything in calculus works and what can go wrong if some things don’t work. Together we will see the importance of mathematical proofs and how to write them. We will talk about real numbers and sets. You will see functions, derivatives, series and integrals in a new light. We will discuss and solve many interesting problems together. In many ways, real analysis is one of the courses that helps you to become experts and creators of mathematical knowledge. Math 341: Algebraic Structures I. When you think about algebra, you probably recall solving equations that involve symbols from your days in middle school and high school. Algebra is actually about much more than just solving equations. 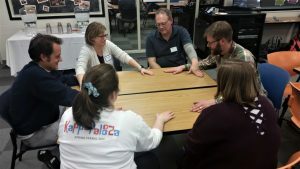 It’s about the study of structure and symmetry of real objects (e.g., a Rubik’s cube or a wallpaper pattern), how to relate the structure and symmetry of one object to a seemingly different object, how to ask good questions and solve problems, and about learning to write clear solutions (i.e., proofs). We will learn about groups, rings, integral domains, and (time permitting) a bit about fields. In this course there will be a moderate amount of lecture. A lot of time in and out of class will be spent exploring and discussing interesting problems with your peers. Reading mathematics outside of class, active learning, participation in discussion, and willingness to investigate will be expected. I guarantee that we will have fun learning math together! Math 351: In College Geometry, we’ll take another look at the Euclidean geometry that you studied in high school, but we’ll also get to find out about and explore several other geometries—finite, affine, hyperbolic, neutral, projective. The thing that made Euclid’s Elements required reading for educated people for 2,000 years is still true: doing geometry is a very effective way to sharpen your ability to reason, argue, and communicate. Math 395: Statistical Methods III begins where MATH312 ends. MATH312 introduces statistical models for predicting response variables which could be quantitative or could be categorical (binary). These models allow for the inclusion of multiple explanatory variables, which are potentially a mix of categorical, and quantitative variables. Statistical Methods III builds on these foundations, where more advanced prediction methods and models will be introduced. The intuition and rationale behind these methods, as well as the conclusions they allow us to make will be emphasized throughout the course, so that the overall objectives of the analyses would not be obscured by the methodologies themselves. Part of the course would involve implementing these methods on multivariate data sets, and iteratively tweaking them for improved predictive performance. Congratulations to Brandon Fuller, Elizabeth Inthisane, Sean Traynor, Fantao Wang, Kameron Wilcox, and Sunnie Zou — all of whom correctly solved the Problem of the Fortnight in the last issue of America’s premiere fortnightly mathematics department news blog. Suppose that f is a differentiable and invertible function on the interval [0,1] such that f(x) ≥ x with equality holding at the endpoints. Given that the region bounded by y = 0, x = 1, and y = f(x) has area A, what is the area of the region bounded by y = f(x) and y = f –1(x)? Write your solution — not just the answer — on a square piece inside a region bounded by a function and its inverse, and drop it in the Problem of the Fortnight slot outside Professor Mark Pearson’s office, room 212 in The Werf, by 3:00 p.m. on Friday, April 5. As always, be sure to include your name and the name(s) of your math professor(s) — e.g. Shirley Wright, Professor Mae B. Soh — on your solution. Good luck and have fun! 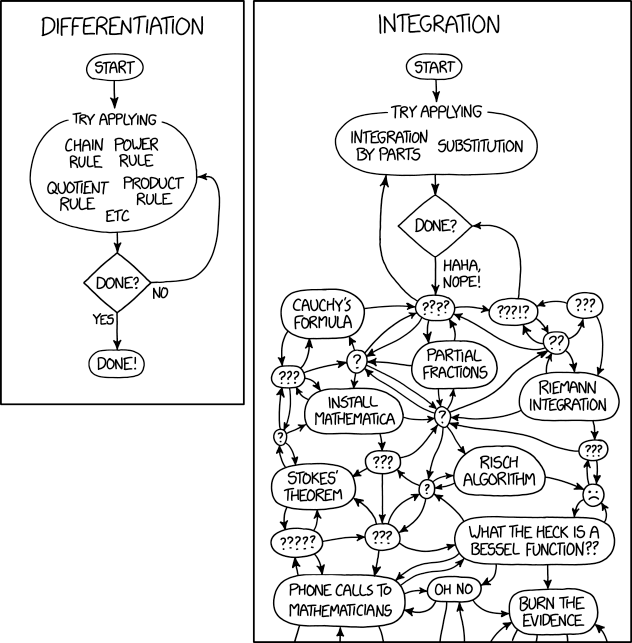 A recent xkcd comic explained the difference between differentiation and integration (or maybe Calc 1 and Calc 2). Abstract: High Performance Computing refers to the aggregation of resources (compute, data, interconnects) to deliver the significant computational power for large-scale problems. Current systems have hundreds of thousands of resources. For example, the Theta supercomputer at Argonne National Laboratory consists of 4,392 nodes, each containing a 64 core Xeon Phi processor, resulting in 281,088 cores. Such machines are used to solve large-scale applications in physics or engineering, for which it is important to analyze the performance of the applications to achieve efficient execution. This talk will provide an overview of HPC systems, motivate the need for performance analysis and modeling, and present some research results from the use of the models to improve performance. Abstract: The demand for computational power continues to drive the deployment of ever-growing parallel systems. Production parallel systems with hundreds of thousands of components are being designed and deployed. Future parallel systems are expected to have millions of processors and hundreds of millions of cores, with power requirements. The complexity of these systems is increasing, with hierarchically configured manycore processors and accelerators, together with a deep and complex memory hierarchy. As a result of the complexity, applications face an enormous challenge in exploiting the necessary parameters for efficient execution. While reducing execution time is still the major objective for high performance computing, future systems and applications will have additional power requirements that represent a multidimensional tuning challenge. To embrace these key challenges, we must understand the complicated tradeoffs among runtime and power, and in some cases resilience strategies. This talk will present our methods and analyses to explore these tradeoffs for parallel applications. Abstract: Can a mathematician be a Christian? Can a Christian student do math? No matter, come discover from the owner of Elvis, the dog who knew calculus, himself a preacher’s kid of deep and intriguing connections between mathematics and theology. Why did the Apostle Paul write, “If the dead are not raised, then Christ is not raised . . ” What is the logical error in the Apostles’ Creed? What do differential equations reveal about the problem of evil? 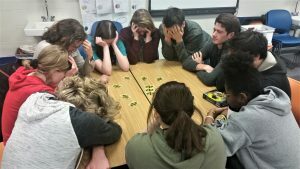 What does “e” have to do with moral dilemmas? How do prime numbers illustrate moral absolutes? How does Cantor’s infinity justify the notion of the Trinity? If intrigued – be there. The following colloquia are currently scheduled for this semester. Students who are interested in applying late should reach out to april.j.verser@gmail.com to verify that positions are still available and to receive an adjusted deadline for applications and recommendation letters. For information about what a counselor does and how to apply click here. Researchers have discovered a pattern to what seemed like the random distribution of prime numbers. The pattern has a surprising similarity to the one seen in atom distribution in crystals. Read more about this in the Motherboard. Congratulations to Camen Andrews, Mara Benitez, Meredith Bomers, Josh Brummel, Anna Carlson, Adam Czeranko, Susie Davenport, Emily Dee, Derek DeVries, Thomas Diaz, Christian Forester, Scott Joffre, Fiona Johnson, Haley Katenin, Michael Kiley, Carson Koning, Jackson Krebsbach, Peter Le, James Mandeville, Cory McGregor, Alex Medema, Matthew Nguyen, Megan O’Donnell, Mark Powers, Grace Purdue, Emma Schaefer, Nathan Schloff, Garett Shrode, Riley St. Amour, Sean Traynor, Bethany VanHouten, Hans Veldman, Neil Weeda, and Tracy Westra — all of whom correctly solved the Problem of the Fortnight in the last issue of America’s premiere fortnightly mathematics department news blog. 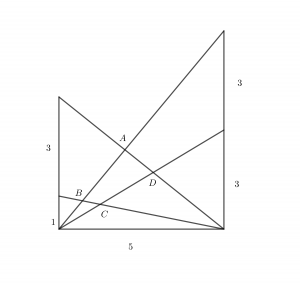 A lattice point is a point in the plane with integer coordinates. If circles of radius r are drawn using all lattice points as centers, find the smallest value of r such that any line of slope 2/5 intersects some of these circles. Staple a pair of NCAA men’s basketball final four tickets (or any reasonable facsimile thereof) to your solution (not just the answer!) and drop it in the Problem of the Fortnight slot outside Professor Mark Pearson’s office, room 212 in The Werf, by 3:00 p.m. on Friday, March 8. As always, be sure to write your name and the name(s) of your math professor(s) — e.g. Rosie DeMeener, Professor Bea O’Goodcheer — on your solution. Good luck and have fun! Abstract: Actuarial Science is an interesting and practical field, with rewarding career outcomes. The American Society of Actuaries offers a sequence of exams, the passing of which allows certification in this field. One of these exams is the Probability Exam (P Exam), for which Hope has a MATH361/363 course sequence which helps interested students in their preparation. In this talk, a brief overview of Actuarial Science and its possible career pathways will be presented. We will then focus on the P Exam by discussing its requirements and solving three past year problems from this exam (which do not require prior knowledge of probability). We will end with comments and encouragement from some Math department seniors who passed the P Exam in its most recent Jan 2019 offering. The following colloquia are currently scheduled for this semester. More should be added as the semester goes on. In the biggest news to hit the math world since we learned that dogs know calculus, researchers in Australia recently discovered that bees know how to add and subtract. They were trained in arithmetic by learning that blue figures meant to add and yellow figures meant to subtract. They were then tested on their arithmetic knowledge by having to make decisions as to which direction to go when walking through a maze based on these color-coded addition or subtraction problems. And the bees in the study could do it, at least better than if they just randomly guessed. You can read a short article about this in Popular Science or the full paper in Science Advances. 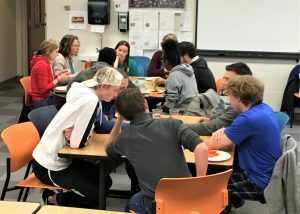 Congratulations to Anna Carlson, Jonathan Chaffer, Adam Czeranko, Emily Dee, Holly Denouden, Christian Forester, Andrew Gilpin, Ruth Holloway, Elizabeth Inthisane, Yiwei Jiang, Fiona Johnson, Jackson Krebsbach, Abigail LaDuke, Grant Lancaster, Julia Loula, Rebekah Ludema, Cole Manilla, John McMorris, Matthew Nguyen, Eleni Persinger, Morgan Platz, Eleda Plouch, Andrew Ragains, Forest Rulison, Emma Schaefer, Bethany VanHouten, Fangtao Wang, Jonathan Washburn, Anna Wormmeester, and Samantha Yacullo — all of whom correctly solved the Problem of the Fortnight in the last issue of America’s premiere mathematics department fortnightly news blog. If you throw a dart at a dartboard in the shape of a regular hexagon of side length 2 feet, what is the probability that your dart lands within 1 foot of any of the six corners of the hexagon. 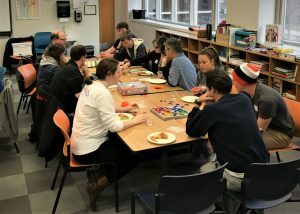 Write your solution — not just the answer — on a piece of paper in the shape of a regular hexagon, and drop it in the Problem of the Fortnight slot outside Professor Mark Pearson’s office, room 212 in The Werf, by 3:00 p.m. on Friday, February 22. As always, be sure to include your name and the name(s) of your math professor(s) — e.g. Chuck N. Darts, Professor Corky Board — on your solution. Good luck and have fun! We need a few students to help build the object shown below. This object (which I’m sure we will learn the name of during the colloquium) will be used in the colloquium on symmetry (details below). We will start the build at 2:00 PM on Tuesday, February 5 in the lobby outside the lecture halls on the first floor of VanderWerf. The build will probably last until around 4:00 PM. If you can’t come at the beginning, you are still welcomed to help when you can. As a bonus you can earn a colloquium credit for helping build! Abstract: Symmetric patterns are used in many situations to decorate an object with a repeating motif that is translated, rotated, or reflected without changing size. We will see examples of several symmetry types and look at these from the vantage point of group theory. In particular, we will study rosette patterns, frieze patterns, wallpaper patterns, and patterns on the sphere. We will then see how we can create all these pattern types with a unified framework based on the vectors and matrices of linear algebra. All four senior mathematics majors from the Fall 2018 Probability for Actuaries class (Calvin Gentry, Jincheng Yang, Evan Bright, and Yizhe Zhang) who took the Society of Actuaries Probability Exam (Exam P) passed it during its most recent offering in January 2019. There will be a colloquium on Thursday Feb 21 at 11am which will serve as an overview of the Exam P and provide a summary of career pathways in Actuarial Science. Prof. Koh will also solve three past exam questions (which will not need prerequisite knowledge of Probability) and some of the students who passed Exam P will be there to share their experience taking the exam and offer advice and encouragement to interested students. 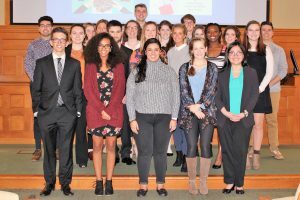 The 17th annual Statistics Showcase, held Friday, January 18, recognized seven outstanding student statistics projects of the Fall 2018 semester. Congratulations go out to all of these students for their hard work and outstanding results. The following projects were presented. 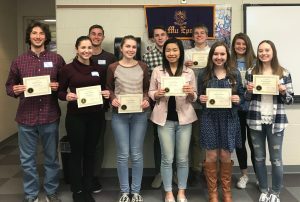 Congratulations to Cal Barrett, Bradley Baysore, Meredith Bomers, Marina Budinsky, Jonathan Chaffer, Regan Corum, Adam Czeranko, Caroline Dargay, Idgie DeLoach, Holly Denouden, Christian Forester, Brandon Fuller, Graham Gould, Sydney Hines, Ruth Holloway, Elizabeth Inthisane, Yiwei Jiang, Fiona Johnson, Michael Kiley, Carson Koning, Jackson Krebsbach, Grant Lancaster, Mitchell Leonard, Dane Linsky, Julia Loula, Rebekah Ludema, James Manderville, Cole Manilla, Michelle Mathenge, Christopher McAuley, Cory McGregor, David McHugh, Marie McLaughlin, Rahja Flowers – Mitchell, Matthew Nguyen, Sarah Olen, Emma Oonk, Josh Paquin, Gina Polito, Mark Powers, Lauren Quenneville, Jack Radzville, Andrew Ragains, Keon Rick, Carmen Rodriguez, Rebecca Ruimveld, Forest Rulison, Nathan Schloff, Meghan Smith, Lydia Sprik, Riley St. Amour, Nelly Tankovo, Sean Traynor, Mary Urdaneta, Bethany VanHouten, Mike Walsh, Fangtao Wang, Jonathan Washburn, Neil Weeda, Lydia Won, Anna Wormmeester, Samantha Yacullo, Sarah Yonker– all of whom correctly solved the Problem of the Fortnight and figured out which dog received the 3.5 kg of food from the butcher. A 3 × 3 magic square is a grid of distinct numbers whose rows, columns, and diagonals all add to the same integer sum. Sunnie creates a magic square whose sum is N, but her keyboard is broken so that when she types a number, one of the digits (0−9) always appears as a different digit (e.g. if the digit 8 always appears as 5, the number 18 will appear as 15). The altered square is shown below. Find N.
Write up your solution (not just the answer) and drop in the Problem of the Fortnight slot outside Professor Mark Pearson’s office (room 212 in The Werf) by 3:00 p.m. on Friday, February 8. As always, be sure to include your name and the name(s) of your math professor(s) — e.g. David Copperfield, Professors Penn and Teller– on your solution. Good luck and have fun! We need a few students to help build the object shown below. This object (which I’m sure we will learn the name of during the colloquium) will be used in the colloquium on symmetry (details below). We will start the build at 2:00 PM on Tuesday, January 29 February 5 in the lobby outside the lecture halls on the first floor of VanderWerf. The build will probably last until around 4:00 PM. If you can’t come at the beginning, you are still welcomed to help when you can. As a bonus you can earn a colloquium credit for helping build! Was that test too easy? Did you ever take a class where you (and most everyone else in the class) received an A without really working that hard? Well that class was too easy. Or maybe you took a class that was a little out of your comfort zone and despite working really hard you ended up with a D. Sounds like that class was too hard. Just like Goldilocks, you need a class that is just right. But what is just right? According to researcher Robert Wilson, a test that is just right (or one that leads to optimal learning) is one in which you score 85%. He calls this the 85% rule for optimal learning. For more information on this, you can read the entire research article here or read a shorter report on the article in Scientific American here. Christian Forester alerted us to this video that gives a very surprising answer to a physics/math problem. In honor of the newly redefined kilogram, we give you the following problem to begin the semester. Anna Berington, one of the 2018 Iditarod mushers, has five dogs — Abby, Betsy, Charlie, Danny, and Ebeneezer — who have peculiar dietary constraints. Each must consume a whole number of kilograms of food every day, and Betsy needs one more kilogram than Annie, Charlie needs one more kilogram than Betsy, Danny needs one more kilogram than Charlie, and Ebeneezer (the lead dog) needs one more kilogram than Danny. The butcher gives Anna 12 packages of scraps whose weights are: 2, 2, 2, 2.5, 2.5, 3, 3, 3, 3, 3.5, 4, and 4.5 kg. The butcher wrote “Ebeneezer” on one of the 2-kg packages and “Betsy” on one of the 3-kg packages, so Anna gave those packages to those dogs. Given the Anna satisfies the peculiar dietary constraints of her dogs, as well as the butcher’s wishes for the two specially marked packages, which dog got the 3.5-kg package? Write your solution (not just the answer) on a sheet of butcher paper and drop in the Problem of the Fortnight slot outside Professor Mark Pearson’s office (room 212 in The Werf) by 3:00 p.m. on Friday, January 25. As always, be sure to include your name and the name(s) of your math professor(s) — e.g. Thu Nome, Professors Balto and Togo– on your solution. Good luck and have fun! It is that time of year. No, not final exams, Christmas shopping. But what do you get the math geek on your Christmas list this year? To help you out, Business Insider made a list of some awesome gifts that include a Klein Bottle bottle opener, a telescope for your iPhone, chocolate gaming dice, and math joke t-shirts. Esty also has a site devoted to gifts for math lovers that includes a Merry X-Math sweatshirt, pi ornaments, and some object that contains a hippopotenuse. (I guess that one is for those where only a hippopotenuse will do!) Head over to Zazzle for prime number mugs, math clocks, and lots of things that say something about math being importanter. (I’m not sure who would buy something like that!) Finally, if you take a trip over to Mathnasium you will find a cutie pi onesie, a hypercube paperweight, and pi cookie cutters. Remember it is only (the smallest square that can be written as the sum of two squares)-days until Christmas! Congratulations to Adair Cutler, Alyssa O’Donahue, Britta Johnson, Calvin Gentry, Camryn Zeller, Ce Gao, Chris McAuley, Christian Erickson, Dane Linsky, Dylan Burke, Ford Fishman, Hugh Thiel, Jacob Zoerhof, Jordan Corstange, Julia Loula, Kachikwu Nwike, Kam Wilcox, Karen Quay, Keegan Frisbie, Lydia Meinhard, Mackenzie Green, Mark Powers, Meredith Bomers, Micaela Wells, Mikaelah Snoap, Thomas Kouwe, Valerie Dien, Yizhe Zhang, Zach Wylie, Jonathan Washburn and Zheng Qu – all of whom correctly solved the Problem of the Fortnight in the last issue of America’s preeminent fortnightly mathematics department newsblog. Positive integer n has the property that n – 64 is a perfect cube. Suppose that n is divisible by 37. What is the smallest possible value of n? 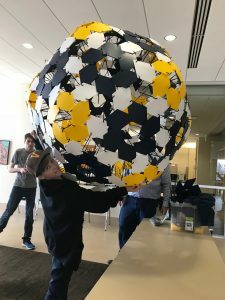 Write your solution (not just the answer) on a Christmas decoration of your own making, and drop it in the Problem of the Fortnight slot outside Professor Mark Pearson’s office, room 212 in The Werf, by 3:00 p.m. on Friday, December 7. As always, be sure to include your name and the name(s) of your math professor(s) – e.g. Carrie A. Toone, Professor Carol Ling – on your solution. Good luck and have fun! Graph Pebbling colloquium this week! Abstract: Pebbling is a process defined on a connected graph. Pebbles are configured on vertices of the graph and are moved along the edges. A pebbling move consists of taking two pebbles from a vertex, placing one on an adjacent vertex, and discarding the other. The objective of pebbling is to put at least one pebble on a designated vertex, called the root. A configuration is called solvable if any vertex can get at least one pebble through a sequence of moves. Pebbling can be used in transportation and communication networks and optimal resource allocation. Some interesting questions arise: How many pebbles are enough to guarantee that any configuration is solvable ? What are the optimal ways to move pebbles? Can we construct an algorithm that determines if a given pebbling configuration is solvable? In this colloquium we will try to answer some of these questions along with the discussion about the existence of the threshold phenomenon in pebbling. We will see how the solvability of a random pebbling configuration dramatically changes after the number of pebbles reaches a certain value called the pebbling threshold. We will also discuss new results in pebbling related to the two-pebbling property and Graham’s Conjecture on the product of graphs. Abstract: Approximations of the value of pi are known to a ridiculous number of digits. But to actually establish that pi is not a rational number requires not just approximations, but proof. The first proof that pi is irrational was given by Lambert in 1761, and it required some sophisticated analysis, but in 1947, Ivan Niven gave a remarkably short and clear proof that pi is irrational using only ideas from calculus. (So it is as easy as pi!) We’ll take a detailed look at Niven’s proof as well as peeks at some of the history of pi in mathematics. And of course there will be poetry. David Montague, the Director of the Memphis Teacher Residency (MTR), will be on campus next Wednesday, November 14th to speak in Chapel and recruit for MTR. He is also hosting an Information Session on that same day from 6:30-7:30pm in VNZ 247. MTR provides a full year residency program preparing teachers for work in low-performing public schools in Memphis. They offer a Master’s degree in Urban Education (tuition free), a full year internship co-teaching with a mentor teacher, free housing and a monthly living stipend. Their mission is Christian love expressed in equal education. Congratulations to Cole Persch, Evan Bright, Holly Denouden, and Caleb Stuckey– all of whom correctly solved the Problem of the Fortnight in the last issue of America’s premiere fortnightly mathematics department newsblog. Consider the sequence a1 = 2, a2 = 3, a3 = 6, a4 = 18, . . . , where an = an-1 . an-2. What is the largest k such that 3k divides a11? Write your solution on a paper plate turkey (paper hand turkeys will also be accepted) and drop it in the Problem of the Fortnight Slot outside Professor Mark Pearson’s office, room 212 in The Werf, by 3:00 p.m. on Friday, November 16. We are hoping for a rafter of turkeys to appear in the Problem of the Fortnight slot next week! As always, be sure to include your name and the name(s) of your math professor(s) – e.g. Tom Gobbler, Professor Herb Stuffing – on your solution. Good luck and have fun!